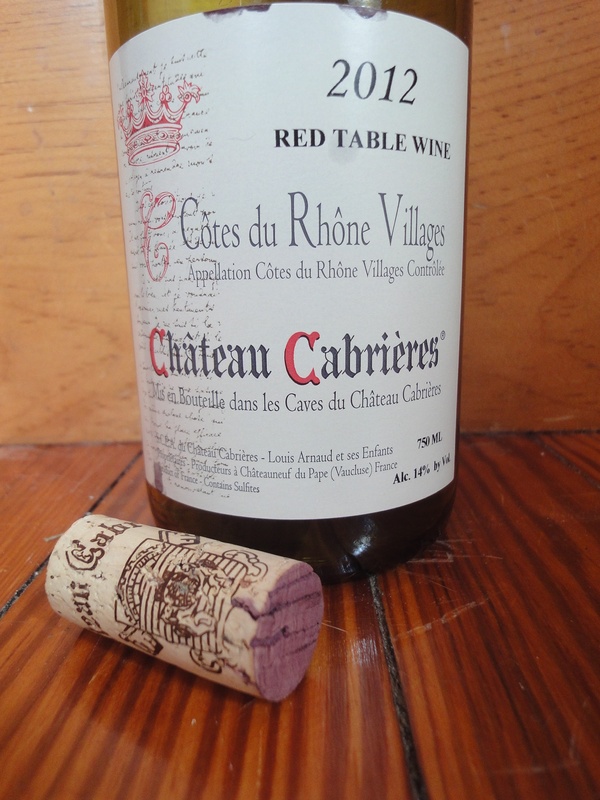 In ranging across the world of red blends, if Ménage à Trois Midnight—a one-note wine lacking nuance—sits at one end of the spectrum, then I propose a candidate for the opposite end: Château Cabrières Côtes du Rhône Villages 2012. I single out this wine because I tried it recently, and was duly impressed. But any of a wide selection of Côtes du Rhône Villages would suffice to demonstrate my point. Côtes du Rhône Villages is a mid-point category, in terms of price and quality, in the southern portion of France’s Rhône region—a step above wines labeled simply Côtes du Rhône and below those from specific vineyards or vineyard areas (e.g., Châteauneuf-du-Pape or Gigondas). Wines in the Villages category generally offer superior power and complexity for the price (many in the $14 to $18 range). From the initial pour, my nose picked up chocolate while I tasted dark berries overlaid with, I swear, sausage and oregano pizza! Some ash, some earth emerged as I drunk my way happily through the bottle. The flavors evolved continuously. If you enjoy conjuring up aroma and flavor analogues to what you’re drinking, this wine—a 50/50 blend of Grenache and Syrah—will keep you busy. While I don’t recommend keeping a bottle open (even in the fridge, even VacuVin’d) as long as I did, I must admit that my last glass remained fresh and unoxidized. I’ve found similar complexity in other Côtes du Rhône Villages. For two years I’ve been working down a multi-bottle stock of Domaine de l’Obrieu’s 2009 Cuvée les Antonins Visan* Côtes du Rhône Villages (*Of the 95 towns or communes in the southern Rhône eligible for the Villages designation, Visan is one of only 16 that can include their name on the label.) It’s going on six years of age—time to drink it up, the wine charts say—but I can report that, so far, the Visan’s body and distinctive flavors have yet to flag.